Decorating a surface with gold leaf, or gilding, is a practice that dates back thousands of years—the first known examples are Egyptian tomb paintings and reliefs from the 23rd century BC. Expensive and notoriously temperamental as gold leaf is, very little has changed in its application over all of that time. 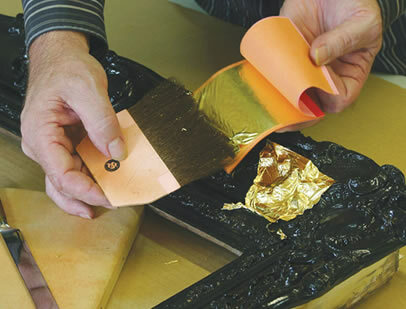 Our conservators perform all water and oil gilding by hand and with an artisan’s eye. We offer a selection of materials, including 22-karat yellow and white gold leaf and metal leaf, in an effort to best distinguish the object’s inherent quality and characteristics.